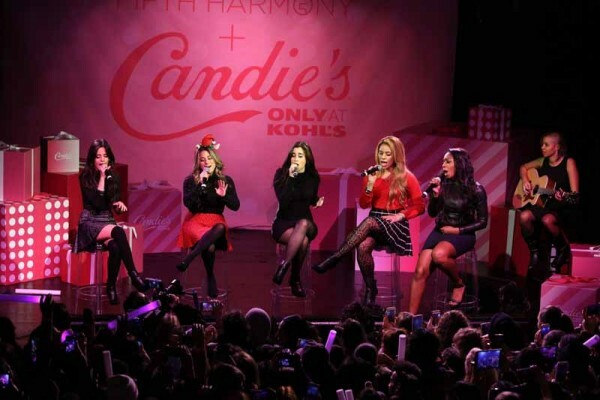 Pop sensation Fifth Harmony treated fans to an acoustic performance on December 10, 2015 at the Candie’s Winter Bash in New York City. Singing hits such as “Worth it” and “Sledgehammer,” the girls sang for fans who had lined up since 6am after winning tickets on Instagram for the exclusive Candie’s show. Fifth Harmony also got guests in the holiday spirit by performing “Silent Night” and posing with oversized wrapped gifts as they asked the audience to join them for a giant selfie. Fifth Harmony, who stars in the brand’s campaign, wore the latest must-haves from the Candie’s holiday collection, available exclusively at Kohl’s.